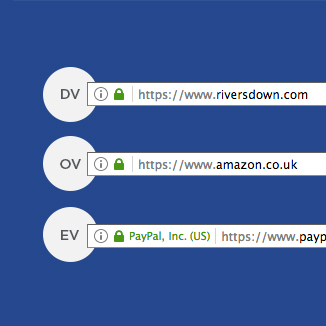 Should your website be using SSL? Google has revealed plans to show the following “Not Secure” alert in future versions of it’s Chrome browser’s URL bar for all HTTP pages. When it does make this update, do you really want your customers to see the below on your website? Google is now using HTTPS as a ranking signal – this means that you gain an SEO advantage from moving to HTTPS. Because SSL gives your website a secure connection, this will prevent malicious third parties from accessing any information given to your business by your website visitors, for example credit card details on a membership or eCommerce site. Seeing the green lock in the URL bar gives your customer peace of mind and has the potential to drive up your conversion rate. In following releases of Chrome, Google will slowly extend the HTTP warnings, as an example, in Incognito mode they will label HTTP pages as “not secure”, as users use this mode when they have higher expectations of privacy. Domain Validation (DV) – low authentication; gives you a green padlock and the word ‘secure’; SHA-2 and 2048-bit encryption; suitable for non-eCommerce sites & basic brochure sites. No warranty included (depends on where you purchase the certificate). Organisation Validation (OV) – high authentication; gives you a green padlock and the word ‘secure’; SHA-2 and 2048-bit encryption; suitable for eCommerce sites & sites collecting personal info; $100,000 warranty (depends on where you purchase the certificate). Extended Validation (EV) – strengthened authentication; gives you a green padlock and names the certificate’s owner in the address bar; SHA-2 and 2048-bit encryption; provides the best security; suitable for eCommerce sites, sites collecting personal info and where user trust is paramount; $1,000,000 warranty (depends on where you purchase the certificate). You can buy SSL certificate from many places, but we would recommend buying one from your hosting company (like us!). Most hosting companies already offer them and some will help you set them up. Plus it’s convenient to keep the cert in the place as the hosting as they go hand-in-hand. If you buy from your hosting company this will be done for you. If you would like CuCo to help with this, feel free to drop us a line and we would be more than happy to help! It’s official! Firefox has now followed suit! As of Firefox 52, you will see a lock icon with red strike-through in the address bar when a login page you’re viewing does not have a secure connection. This is to inform you that if you enter your password it could potentially be stolen by eavesdroppers and attackers. You will also see a warning message when you click inside a login box to enter a username or password. If you have any questions about SSL or need assistance with setup please feel free to contact CuCo and a member of our digital team will be more than happy to help. As of Chrome 62, which is released in October, the ‘Not secure’ warning will be shown in two additional situations: when users enter data on an HTTP page, and on all HTTP pages visited in Incognito mode. This is on top of pages that display forms that have password or credit card fields. Googles future plans are to to show the “Not secure” warning for all HTTP pages, even outside Incognito mode – but the implimentation is taking place in gradual steps, based on increasingly broad criteria. Since the change in Chrome 56, there has been a 23% reduction in the fraction of navigations to HTTP pages with password or credit card forms on desktop, and we’re ready to take the next steps. Passwords and credit cards are not the only types of data that should be private. Any type of data that users type into websites should not be accessible to others on the network. As of Chrome 68 the ‘Not secure’ warning is now shown on any page still using HTTP. In essence, Google is public shaming websites that still aren’t using HTTPS with this move – with other major browsers sure to follow on their heels shortly. This move will be followed in October 2018 Chrome (70), when they start showing a red “not secure” warning when users enter data on HTTP pages. As of Chrome 69 it will focus on highlighting its negative security indicators and will stop marking HTTPS sites as “Secure” on the address bar. This is because Google wants the default state of any website to be secure. It is also looking like that from October, Google will be taking things further – the usually gray “Not Secure” will flash red once you start typing in data into a field such as username or password on HTTP pages to really highlight the warning. First published on 14 Dec 16 – and further updated in May 2017, August 2017, July 2018 & September 2018.